Re: What does the INPUT button from RadioDJ? Wanted to say I LOVE THE INPUT button!!! So I have my Radio DJ connected to a pc with 3 sound cards, route my audio to different channels in the mixer, ie (Deck, Cue, Aux, Carts, etc) Then I have my DJ mic and Guest Mic channels, then a channel for audio recording using adobe audition and audacity which my polycom speaker phone is connected to this sound card so I can record phone calls, interviews etc then air them out. Last I have another PC with touch screen running DAC Free cartwall which is for station imaging. 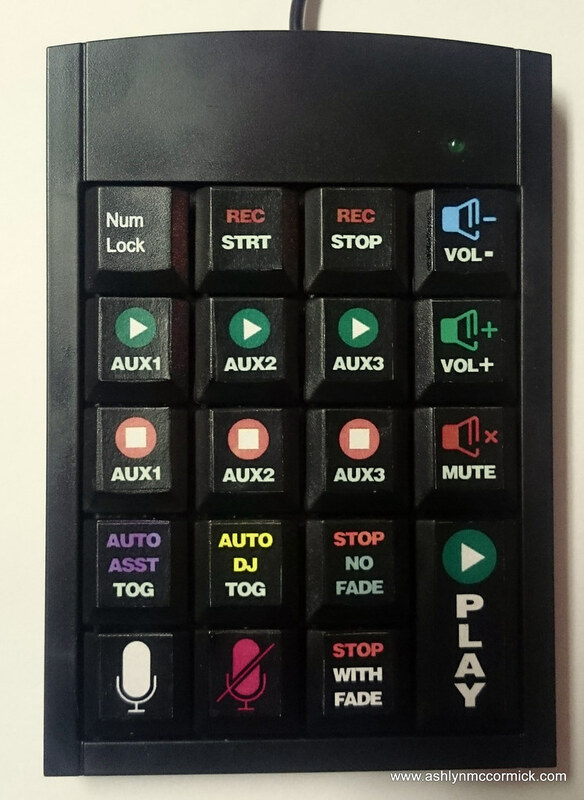 We just started using the INPUT button on live remotes. We use Ring Central voip for a separate line which routes into voice meeter banana software and the app for ring central takes the audio coming back from the board into the phone so you can hear the live broadcast when you call in. Ring Central auto answers the call then we have the INPUT button set to grab audio from the voice meeter software channel which is a virtual channel. So what happens is we build a play list out program beds to talk over. We then print out a cue sheet from radio DJ using the html export then take that with us, We watch what is playing and then remote vnc into the broadcast pc via a laptop, when the bed is about to play we call in the phone is auto answered, ready to go we hear live what is being played before it hits the stream, we hit input say what we need into the phone then hit input again when we are done which mutes the phone boom it airs out sounds really cool just like a live remote would. I am trying to get the android remote apk working to control the input button that way but having issues thats next on the to do list. Anyways to sum it up the INPUT button can do several things, its main purpose is to grab audio and fade down the main mix coming from radio dj. It could be used for live remotes like im doing. I STRONGLY recommend getting a mixer route your audio into then back out of into a good quality sound card like sound blaster then stream it that way. Sounds good, and you have WAY more control over audio feeds. etc. Get a FREE syndicated show for your station streamed live! PM me for details. I would just like to say I am completely happy at this time using the input button to get the microphone on the air as I am just getting into the hobby and I don't want to spend to much cash at this time just incase I decide its not for me, and also I don't put my voice on air much anyway it works for me however that said if I decide this is for me I will invest in some more equipment in the future. New to RadioDJ but not to audio..
One of the first things I looked for when checking RadioDJ was where to plug in the mic. I quickly found the explanation and I honestly do not understand why this would be such an issue. The solution using a separate mic input on a mixer would mean no processing on the mic unless I add it externally. Having the mix signal available in the program would allow for much tighter integration. It would for instance allow a voice over compression of the music stream. The argument might have been true for Windows XP or Vista, but 7 and 8 for sure offer some serious improvement there. Windows 10 offers significant improvements in internal audio latency as well as extremely easy coding to implement both a mic input as well as processing of the signal. Besides that, if I can record multiple live channels while I playback others with minimal latency on my system why should it be hard to have 1 live channel added to a stereo playback channel. Besides all this, It's done by quite a few of other Broadcasting tools. Currently using VirtualDJ but even while it's far more polished and smooth as a program, RadioDJ would suit me better for broadcast.. I truly agree with you. They should put the mic button back, for I have a professional studio within my house basement we are growing daily, I want to continue to use Radiodj, but one of the things that turn me away was not having that option of mic input. I have few ways of making it sound great, one of those ways is connecting my USB M -Audio interface I have now using with Sam Broadcast. So if there a way for us to ask for that mic button I would request it. You don't need a Microphone input in Radio automation software... As mentioned in several posts on this forum the Latency issues were just awful when it did have a button back in the days of 1.6.0. You just need to think smarter! I am not here to pour more petrol on the fire of the microphone issue, but yes, I agree that it would be a bonnus. My own case scenario is, I have a radio show that goes daily in a radio network from my country of origin and in most cases I made the show from my studio using RadioDj routed via a mixer etc etc. so far so good. However these days for personal and professional reasons a see myself forced to travel a lot and therefore I have three options. 1 pre-record the show, which means to put extra time on an already very busy schedulle. 2 use another software (I.E Radioboss) which allow me to made the microphone mixing without using a hardware mixer, and I have already done it with no bad results but... I miss Radiodj as it has been for years my tool of choice. 3, under trial right now, use the imput button with a mic attached to it and don't use headphones (lots of profs don't need the headphones) and this way forget about latency. But no doubt that when doing all by yourself (no another guy controling) the headphones are somehow needed to know that everything is going well. Some people need to know what "automation" means. Atomation means that the playlist, playout and switching to different sources are done automatically. So an "INPUT" can mean any input you want or need. A line "INPUT" is an input but a microphone is an "INPUT" too. Even a phone output can be used as an input to RadioDJ. Does it need to have that name too? No it still is and will be for ever an "INPUT". Now for the people who need the microphone input on an automation system, try the following thing. Put your microphone in the mixer. Use an "INSERT" and put in a delay of 1 to 2 seconds. Put your CD player directly to one of the channels and try to make a tight presentation over the intro of any track. You can't do this and allways be late. Anyone who wants to have no latency, you have to put more money into it to get that. Just to make it even more obvious, every professional radio station use any kind of mix board to do the show on. The automation isn't even within range of the DJ. They never push a "INPUT" button to get on air, that is done by the automation. In the studio there will be an assist version running of that automation, assisting the DJ to play tracks. No latency on audio in? You need to buy stuff for that. Some of the requests for RadioDJ are allready made so if you want that, it is only costing $20.000 or euro's. With all the hardware you need. If Marius want to implement all this, he is getting in that same range of money and it won't be free anymore. 1. Is there a bit of audio latency? Yes. 2. Is it a problem? Not at all. ...automatically mutes the audio monitor be it headphones or room speakers whenever the INPUT is toggled on custom built control pad to open the mic. This way you don't hear your voice coming back with the split-second latency that many find distracting. And, because Marius has done such a wonderful job of engineering the audio processing, the audio quality from your microphone input is exceptional (so long as you're using good kit, that is - you get what you pay for). If you are just starting out with online broadcasting and you are looking for a simple, but professional sounding setup, there is absolutely nothing wrong with using the INPUT feature in RDJ for your microphone so long as you are prepared for the audio latency issues in advance. They're only apparent to the DJ when listening to the local monitor, but it's not at all noticeable by your listeners. To them you just sound incredible. Being that it is right beside the queue/playlist scroll bar - i tend to click on the "Input" button by accident, from time to time, which changes the sound being broadcast. So, i personally, don't like where the button is located.